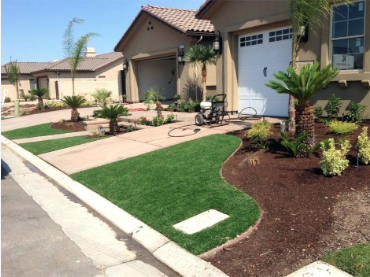 Take your landscape to the next level with artificial turf and synthetic grass! It can be especially useful if you have kids or pets. We install pet turf that is durable and ultra-resistant so that your dog can run around and do everything he wants without damaging your grass. The applications for artificial grass are numerous: pet turf, pool decks, patios, playgrounds, play fields, putting greens, and even driveways! 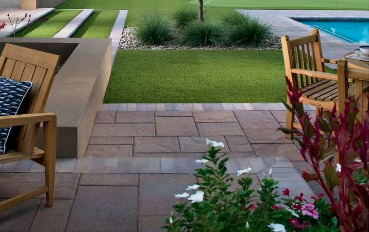 We have seen many creative things over the years including intricate patterns using both pavers stones and strips of imitation grass interwoven and layered. 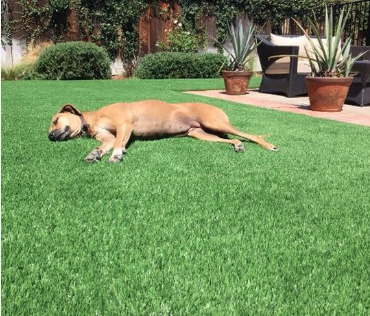 Let us install the style of artificial grass of your choice the right way and you will soon have a brand new recreation area for your pet to play or guests to be entertained. Depending on the size of the area, it might take a few hours or a few days if your backyard is really big. We will give you a preliminary estimate based on the size of the surface that needs to be covered as well as material type desired. Consider using synthetic grass for all types of areas including your garden, front entrance, and patio areas, it is a great option and you will quickly find it has many benefits to offer. The primary qualities of this type of fake grass is that it is both extremely comfortable as well as very stress resistant. Additionally If you’re still on the fence and don’t know why you should choose artificial grass, here are a few reasons that could tip the balance in favor of it: its cleanliness, safety, accelerated drainage, ability to control odor, ease of maintenance, and finally a durable construction beneath, which means you won’t have to deal with any holes or brown spots even if you have a pet that tends to destroy everything around them! Explore our other fantastic options beyond the yard and consider installing artificial grass in your man cave, garage, or balconies! We use high-tech fibers and the blades of our grass are like no other. We work with experts in the industry in order to offer the best in terms of synthetic grass quality and low price to market. Visually, today's offerings look very convincing and when you touch it, you feel the striking resemblance to real grass as well. There are plenty of sizes and varieties available, specifically designed for functions ranging from pet resistance to golf coarse putting greens. We don’t like to operate with “one-size-fits-all” mentality, but enjoy designing custom solutions for our loyal customers. if you have an idea, just let us know and we will do everything in our power to make it come true. The price of this kind of grass is far from being prohibitive, actually, you may even be surprised by how affordable it is. And its excellent price point doesn’t come at the cost of being cheap either. The appearance is aesthetically pleasing and the colors and materials offered always look extremely realistic. We work hard to provide our customers with beautiful synthetic grass solutions that look amazing and improve the curb appeal of your entire home. Artificial turf is a care-free solution and the perfect alternative to regular grass! Get in touch today at 321-280-9011 to learn more about our related services and book an appointment for a synthetic grass installation if you have already made up your mind.